Kenny Jackett wants Pompey to finish the season with a defensive record of a goal a game. The boss believes any side that earns promotion shouldn’t ship more than 46 times throughout the duration of the campaign. The Blues have had no trouble putting the ball in the back of the net during their push for the Championship. After scoring four against Rochdale on Saturday, only leaders Luton (81) have scored more than Pompey’s 75. However, Jackett’s troops have let in 44 in total – only the fifth best. The manager pinpointed victories over Walsall and Wycombe, when his side conceded twice on each occasion, as disappointing. But with the Blues firmly in the race for the top two, he’s challenging his players to ship no more than two goals in their remaining five fixtures. Jackett said: ‘We are second top scorers in the division behind Luton. ‘However, we are conceding just more than a goal a game and I think we can get less than a goal a game. ‘In a promotion season, the goals-against column should be less than 46. That’s where we are. 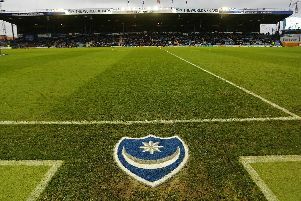 Pompey moved to within two points of the automatic promotion places with their win against the Dale on Saturday. Sunderland’s dramatic 5-4 loss to Coventry also allowed the Blues to move level on points with the Black Cats. It means Jackett’s side’s fate rests in their own hands. The boss added: ‘We do see it in our hands and maybe need to fortunate around us because other clubs will be saying the same. ‘We have to concentrate on ourselves, do as well as we possibly can and then see where it might take us. ‘It’s about playing well and having all the ingredients that produce a good football team. ‘We need to concentrate on those, identify the our strengths, keep working on where we need to improve and then have confidence in ourselves in games and not complacency. ‘We have to work as hard as we possibly can to earn every point we get and see where it takes us.